The UNICEF Tap Project is a nationwide campaign that provides clean water and adequate sanitation to children around the world. Currently, UNICEF works in more than 100 countries around the world to improve access to safe water and sanitation facilities in schools and communities and to promote safe hygiene practices. 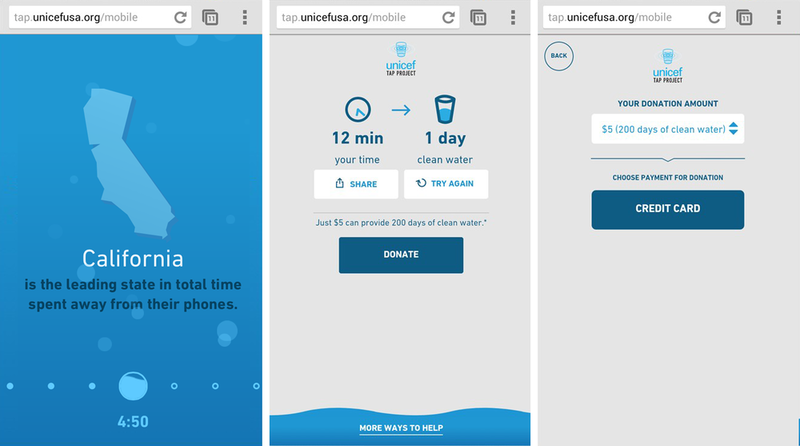 The agency behind the Unicef Tap Project, Droga 5 (Ad Age’s 2014 Agency of the Year), developed a concept that challenged people to go without something thought to be vital, the all-powerful smartphone, as a way to educate them about the problem as well as give them a way to contribute to the solution. The concept and strategy were sound, but being fluent in brands, product development, and games—they contacted me to assist this all-important project. The UNICEF Tap Project is back on March 1st, 2016. How long can you go without your phone for this year's challenge? 5 minutes could help provide a child with clean water for 1 day -so every minute counts! Take the challenge on your smartphone at http://uniceftapproject.org and dare your friends and family to beat your time. ...while the concept was creative, the visual design solid, and the intent of the app appealed to a user's good will; the app was having difficulty holding users' interest and it was definitely not compelling enough to retain users for repeat sessions. It was something that you could easily start but just as easily forget about in our very fragmented world. That was a problem. The main issue was that in it's current state the game was merely an endurance test without any feedback about progress towards the goal, no fanfare for achieving certain milestones, and no charting of your progress against other people taking the challenge. · A "Local Roll Call" and "Best State" status communicating how many others in their state were participating at the time. The results (above) speak for themselves. It was a pleasure working with Droga5 on this project and extremely rewarding to help children in need.